Weekly Student Progress Reports...Discover how to communicate with your child’s teacher on a regular basis "WITHOUT" the hassle of conferences or even phone calls. How Flash Cards Make Learning Fun...This new and improved version available to your child will make studying more efficient, fun and entertaining. Reading Textbooks Just Became Entertaining...We know it sounds crazy, but this new breakthrough approach is used by reading specialists as a proven way to reduce frustration while improving comprehension. Student Weekly Planning Made Easy...Keeping track of school work priorities and deadlines will become a breeze for your child after watching this video & downloading the handout. Never Before Revealed Positive Parenting Tips...Instead of becoming frustrated, angry, or even disappointed that your child didn’t make the optimal choice, the "You Decide" handout & video will help your child think about the consequences every time she/he makes a choice. Parent Teacher Conference Questions... Gain the skills and knowledge you need to control the conference so you can walk-away feeling confident that you have the information you need to help your child be successful. Typing For Your Child...Discover the key activities that will make learning to type correctly a fun endeavor for your child no matter the age. In today's day and age, typing is a necessary skill that your child has to master to ensure long term success with school and any career. How To Improve Reading Skills...If your child is shutting down when it comes to reading or trying to rush through a passage only to have no idea what they just read, watching this video is an absolute must. Give your child the tools they need to read effectively and retain what they read. Shari's video and handout will help you do just that! 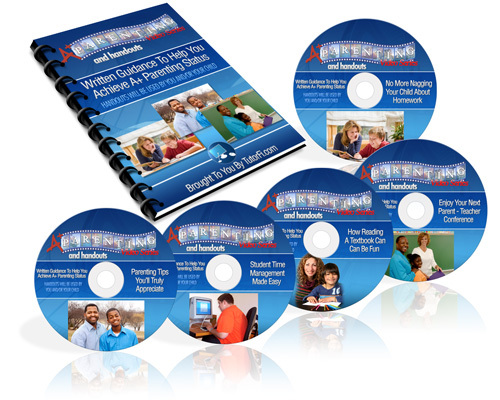 So Many Other Videos Designed To Help You Become an A+ Parent...You'll truly appreciate these videos GUARANTEED! A+ Parenting Video Series was created by our TutorFi.com team of educators who have been consulting with parents since 2003. Over the years, we've consulted with parents to help them be the best parents they could be and we recenlty created our A+ Parenting Video Series as a resource you'll truly appreciate. This is a limited time special offer that allow parents to access our videos at no cost (the dvd collection sells or $297). Sign up below for TutorFi.com's... A+ Parenting Video Series. Many of TutorFi.com's tutors are also teachers who work with students in the classroom on a daily basis. They've become masters at identifying and targeting the unique learning styles of each student. Our A+ Parenting Video Series not only shares their secrets directly with you, but we'll also help you as a parent to understand your child's approach to learning, motivation, and possible causes for both success and failure. Each video was carefully created to consider the physical, mental, social, and emotional changes that children will experience as they mature. We are aware of how these changes may impact your child's approach to school and their relationships with your family. As a parent, you will gain insight into the mind of your child and come to better understand the choices they make and how to guide them into becoming mature, responsible young adults. Time and time again, the subject of parent-teacher communication seems to always be a factor in the success or failure of most students. We're going to share helpful tips with you to ensure that you and your child's teachers are working efficiently to support and improve the academic experience for your child. In the A+ Parenting Series, we'll provide you with tips and insight you need to help build a better relationship with your child's teacher and to improve communication. Over the years, our TutorFi team has spoken with 1,000's of parents who each have different goals and hopes for their children. Before we created these videos, we had a realistic understanding of how difficult it is for families to balance work, a busy schedule, meals, household chores, daily activities, and of course, a never-ending pile of homework. We made sure to offers tips and strategies that parents can immediately implement to help their children become more efficient and organized and reduce the stress that schoolwork often adds to a family. Many of our videos focus on showing you new, unique ways to get involved in what your child is learning. Our videos also share the same strategies that teachers often use in the classroom. This will allow you as a parent to see immediate results with it comes to communicating, motivating and celebrating your child's accomplishments. Watch the A+ Parenting Video Series to see how you can not only make learning more fun for your child but how you can get your entire family involved and improve the lines of communication between yourself and your child.